George Donahue practicing the ready position at the start of a kata. Sometimes, a change in altitude can be better—far better—than a change in attitude. Anyone who practices martial arts long enough will eventually have times when nothing seems to improve. We don't gain understanding, we don't get faster or stronger, we don't get better in any way. If we stay stuck like this for too long we actually start to get worse, in many ways. If you get mired in this situation, and you train alone, you often just have to hope that you’ll pull through eventually. However, if you have a training partner or teacher to give you feedback, you can try the following method. First, have your training partner lie on the floor to watch your kata or technique. The partner should begin by watching the space between the bottoms of your feet and the floor. The partner will notice immediately if you are wobbling or otherwise unbalanced, raising the heels, the toes, or the balls of the feet when they should be grounded or gripping the floor, or sliding when you should be staying put, and vice versa. From that same vantage, your partner can then check to see whether your knees align properly with your feet and back—or if they’re wobbling. What’s “proper” differs with the technique, of course, but your partner should be able to pick this up easily. After the knees, the waist can be checked for alignment, too. The next thing your partner can check is to see whether your hips and shoulders dip when they should remain horizontal or remain even when one or more should be dipping or raising. Other faults, unfortunate habits, or outright mistakes might be visible, too. Next, try having your partner observe the view from above. This can be done from stairs, a stepladder, or even by standing on a chair. You don’t need to be watched from a sitting or standing position, as that is the norm. From above, it’s easy to see whether the head is properly aligned with the shoulders and torso. It’s also easy to see whether you are toppling meekly into a stance or striding forcefully. This vantage is good, as well for watching the placement and snap of the attacking hand or leg, but it’s particularly good for wacthing the pulling hand and arm. Copyright © 2011 George Donahue & FightingArts.com. George Donahue has been on the board of FightingArts.com since its inception. He is a freelance writer and editor, providing literary and consulting services to writers, literary agents, and publishers, as well to advertising agencies. He has worked in publishing for more than three decades, beginning as a journal and legal editor. Among his positions have been editorial stints at Random House; Tuttle Publishing, where he was the executive editor, martial arts editor, and Asian Studies editor; and Lyons Press, where he was the senior acquisitions editor and where he established a martial arts publishing program. He is a 6th dan student of karate and kobujutsu—as well as Yamane Ryu Bojutsu—of Shinzato Katsuhiko in Okinawa Karatedo Shorin Ryu Kishaba Juku. He was also a student of Kishaba Chokei and Nakamura Seigi until their deaths. 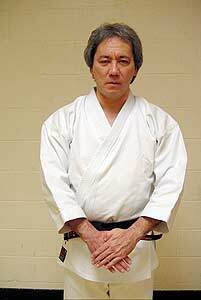 He teaches Kishaba Juku in New York and Connecticut, as well as traveling to provide seminars and special training in karate, weapons, and self-defense. His early training was in judo and jujutsu, primarily with Ando Shunnosuke in Tokyo. He also studied kyujutsu (archery), sojutsu (spear), and kenjutsu (swordsmanship) in Japan as a youth. Following his move to the US, he continued to practice judo and jujutsu, as well as marksmanship with bow and gun, and began the study of Matsubayashi Ryu karate in his late teens. Subsequently, he has studied aikido and taiji and cross trained in ying jow pai kung fu.